Kwame Dawes’ base was the flat prairieland of Lincoln, Nebraska, a landscape in which he, a black man, originally from Ghana and Jamaica, felt at once alien and deeply committed to the challenges of finding “home”. John Kinsella’s base was in the violently beautiful landscape of Western Australia, his home ground, thick with memory and the challenge of ecological threat and political ineptitude. In the first cycle, Echoes and Refrains, the poets sought and found a language for this conversation of various modes and moods. They were linked by the political and social upheavals in their respective spheres – Dawes contemplating the waves of violence consuming the US and the world, and Kinsella confronting the injustice of the theft of indigenous land and the terrible treatment of refugees and immigrants. These poems chart an unpredictable journey towards friendship. They reflect commonalities – love of family, cricket, art, politics, music, and travel – and in poem after poem one senses how each is hungry to hear from the other and to then treat the revelations that arrive as triggers for his own lyric introspection – risky, complex, formally considered and beautiful. They stretch one another, and provoke to a poetic honesty that comes with authority and assurance. In the second cycle of poems, Illuminations, locations shift but the concerns remain and are considered in different lights. 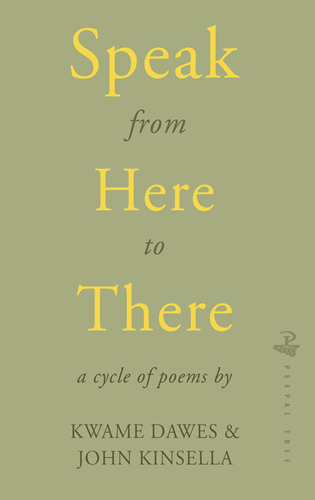 Speak from Here to There reminds us of how poetry can offer comfort and solace, and how it can ignite the peculiar creative frenzy that enriches us. .
Read an excerpt “Illuminations” Boston Review . April, 2016. "One to Another" . Karen McCarthy Woolf. The Poetry Review. Spring, 2016.